Radiesse® is an effective dermal filler injection for restoring lost volume and filling moderate wrinkles. Radiesse is composed of calcium hydroxylapatite, a mineral-like compound found naturally in human bones. 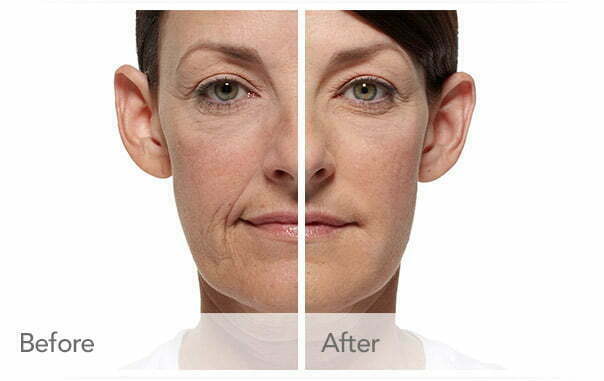 Radiesse is a great option for improving the appearance of moderate-to-severe creases and folds. Results are very natural and side effects are rare. $625 to $725; patients typically experience no downtime. When it comes to improving the appearance of moderate to severe facial wrinkles, not all treatments are created equally. To replenish lost volume, fill in deeper wrinkles, and improve the appearance of nasolabial folds, Radiesse® is a great solution. As you age and your face begins to show signs of hollowness and wrinkling, volume loss is often to blame. When your body slows production of collagen and elastin, the result is skin that less firm, lacking suppleness, and more prone to fine lines and wrinkles. An ideal way to achieve wrinkle reduction is by replenishing this lost volume. Radiesse has a unique formulation that stimulates your body’s natural production of collagen, temporarily smoothing out visible signs of aging and providing natural-looking results. If you’re interested in seeing what Radiesse can do for you, contact us today for a personalized consultation. Dr. Buford will work closely with you to determine the best treatment plan for achieving results you will love.